Two recent columns capture the need to save the space program--and thereby to restore that which made America great. Please add your thoughts too in the comments section. "A feeling of awe and wonder. 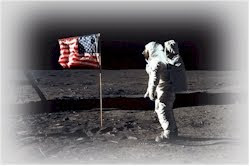 There's nothing that can compare to it, and the manned space program gave it to us as a nation. The president needs to rethink his priorities and reaffirm America's commitment to manned space exploration, as President Kennedy had the foresight to do 50 years ago." "The Obama administration apparently thinks it's more important to spend billions of dollars on money-losing high-speed trains manufactured overseas than on manned space exploration using cutting-edge vehicles made in America." "I mourn the loss of the exploring spirit that put the Apollo astronauts on the moon. I fear, in our preoccupation with the problems of the day, we are giving up on an essential component of what has driven society forward for all time, the need to push out and expand our horizons."